Today brings us to the third great festival of the Church Year. There’s Christmas, then Easter, and now Pentecost. Of course, Christmas and Easter get all the publicity...and those two festivals attract the crowds. Pentecost is the most ignored of the Church’s most important festivals. Maybe it’s because the Holy Spirit, the One Whose coming fifty days after Jesus rose from the dead Pentecost celebrates, doesn’t really call attention to Himself. There's probably another reason. Painters and cartoonists may show God the Father as a white-bearded old man. And Jesus has been the focal point of endless artistic renderings for the past two-thousand years. But the Spirit, even though the Bible says He has a personality--Jesus calls Him a Counselor, a Comforter, an Advocate--is hard for us to picture. The Holy Spirit, of course, is sometimes shown as a dove. That’s because Luke’s Gospel, for example, tells us that when Jesus was baptized, the Holy Spirit came to Him in the bodily form of a dove, a bird that the ancient Jews thought of as pure. Sometimes the Spirit is shown as fire. 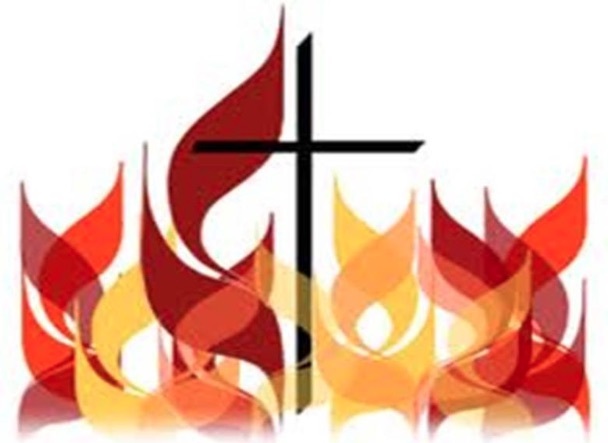 This is appropriate not only because in our lesson from Acts today, the Holy Spirit rested on 120 praying followers of Jesus like tongues of fire, but also because of some properties that fire shares with the Holy Spirit. Fire enlightens, destroys, and purifies. So does the Spirit of God, depending on our needs at the time: He can show us the way to Christ. He can decimate our excuses and rationalizations for sin, kill off our old selves so that our new selves can rise, as happens in Holy Baptism and every time we repent in Jesus’ name. He can also purge us of sin and free us from temptations to sins that would contaminate us and separate us from God. And sometimes, the Spirit is seen as Wind. This too, is appropriate. The word translated as spirit from the Old Testament Hebrew is ruach, a word that also means wind or breath. It’s God’s ruach--His Wind or Spirit--that moves over the waters in Genesis to create the world. It’s also God’s ruach that God breathes into dust to make the first human being. In the Greek of the New Testament, the word pneuma has the same multiple meanings as ruach. Pneuma can also mean wind, breath, or spirit. But the problem with trying to picture something like wind or breath is that, as Jesus told the old Jewish teacher Nicodemus, you may hear the sound of the Spirit—and on the first Pentecost, the Spirit must have sounded like a tornado filling the house where the first disciples had been praying--but you can’t really see Him. You can only see evidence of His presence in the lives of those who trust in Christ as their God and King. Maybe the Spirit’s insusceptibility to being pictured is why we attach so little importance to Pentecost. Maybe too, it’s easier to understand what Jesus does for us than it is to understand what the Spirit does for us. At Christmas, we understand that Jesus, God the Son, took on the burden of being human. At Easter, we understand that after offering up His sinless life as the perfect sacrifice for our sins, Christ rose to give life to all who turn from sin and follow Him. But what exactly does the Holy Spirit do for us? But I want to talk about just two things the Spirit does for us today, as seen in our first lesson, which comes from Acts 2. First, the Holy Spirit gives us the courage to live past our fears. Before the events recounted in our lesson, 120 followers--disciples--of Jesus had gathered in a room to, just as Jesus had ordered them to do, wait and pray for the power of God to come upon them. When the Holy Spirit showed up “like the blowing of a violent wind,” they did something they probably couldn’t have imagined doing moments before: They went out onto the hostile streets of Jerusalem and told anyone who would listen about God's mighty deeds. They conveyed the message that all who call on the Name of the Lord will be saved. The Spirit gives courage to people who pray. This is important to realize. It seems that the number one fear of Lutheran Christians is doing precisely what the Holy Spirit empowered the first disciples to do on the first Pentecost: Share the good news that all who turn from sin and trust in Jesus Christ have life with God that never ends. “I could never do that,” we say. Listen: When Ann and I find a new restaurant we like, we have no hesitation about telling friends about the place. We describe the food, the service, the prices. I bet that you’ve done the same thing. Why is it easier for us to talk about a restaurant that will, at most, feed us one meal at a time...for a price...than it is for us to talk about Jesus, the living Bread from heaven, Who is the only One Who can give us eternity? You know the reason: We let our fears, not Jesus, to control our thoughts, our feelings, our actions. The Holy Spirit also gives us a reason for living. Often, elderly people will ask me, “Why hasn’t God taken me yet? What am I still doing here?” These people think that because they’re less physically capable than they once were, their lives are less worthy of living. Children can also grow frustrated by the limitations of their youth. And the chronically ill think that their lives have less value because of what they can't do. But you and I have value not because of what we do, but because of who we are. This last question is critical, because it’s only those who live in constant fellowship with Jesus--not with their fears, not with their preferences--but with Jesus, Who will be empowered to live for Jesus and share Jesus with others, no matter what limitations may dog them. Their lives will have power because they live only in the power of the crucified and risen Jesus Christ. One of my favorite passages of Scripture appears in Matthew 25. In it, Jesus describes how He will judge people at the end of the world. He turns to the people He describes as His sheep and tells them, in essence, "Because you clothed Me when I was naked, visited me when I was in prison, fed me when I was hungry, and so on, enter into the joy of eternity with Me." But their reaction says everything. In essence, they tell Jesus, "We don't remember doing any of that stuff!" Listen: You cannot be saved from yourself, saved from sin, death, darkness, or futility by anything you do. None of us could ever do enough--or be good enough--to get into eternity with God. Ephesians 2:8-10 says that we are saved only by God's grace, God's charity, given to those who dare to trust in Jesus. So, nobody has any right to brag. All we are are people in whom Jesus lives and Jesus does His good work. You see, even the good I do doesn't come from me; it comes from Jesus. All I'm to do is trust in Him and get out of His way! So, Jesus' commendation of the "sheep" in His portrayal of the judgment in Matthew 25 shows us that we aren't judged for what we, in our own strength, are able to do. We're only judged on whether we have entrusted our lives to Jesus and so, without our even realizing it, become instruments through whom, Christ does His loving, life-giving work in the world! Many of you have read Ole Hallesby's classic book, Prayer. The story he tells near the end of the book is something I come back to again and again. There was, in Hallesby's home village in rural Norway, a man who was practically an invalid from birth. He could do little work. As he aged, he became bedfast and had to be cared for by several women from the village. Though he had been limited in his mobility, his funeral was the most well-attended in Hallesby's village. Why? Because he had done what he could in response to Jesus' love and grace: He prayed. People would come from miles around to ask him to pray for family members, friends, or themselves and to receive his wise Biblical counsel. On his daily prayer list were babies and children he never met. That man's life had a deeper purpose and meaning although he seemingly could do nothing: By his surrender to Jesus, God gave him purpose. To give God glory and to point others to the God we know in Jesus. The first followers of Christ must have wondered after Jesus ascended into heaven why they were still around. In Jesus, they’d glimpsed eternity and they wanted to be with Him. But here they were, stuck on a planet filled with people who would rather worship themselves, possessions, power, prominence, or their country, or their political party, rather than the God Who made them and died and rose for them. They were stuck living a life in which they would have to struggle and possibly suffer...because they believed in the crucified and risen Jesus. But when the Holy Spirit came, He gave Jesus’ praying followers a reason for living this as fully as they could. In short, the Holy Spirit gave them a vocation. Some of you have heard me speak before of our friends Sig and Chris. They came to this country from Germany in the early-1960s. Sig was an engineer and Chris was a pediatric intensive care nurse. But above all, they were ambassadors for Christ! When Sig was dying, he was a patient at a hospital in Cincinnati. His room was a holy place, bathed in prayer, filled with the presence of the Holy Spirit. When Sig would occasionally regain some semblance of consciousness, he would ask that Scripture or writings by his favorite writer, Dietrich Bonhoeffer, be read to him. People who weren't even believers asked if they could spend time in that room, so palpable was the presence of God. Even as he lay dying, you see, Sig had a purpose for living. He had a vocation. He honored God and showed Christ to others even in his dying. The Holy Spirit doesn’t get a lot of attention. The Spirit takes a backseat in the Trinity, content with being Jesus’ megaphone as Jesus speaks new life to us, content with silently supporting us as we call out to Jesus, follow Him, and share Him with others. The Spirit never calls attention to Himself. But He showers us with gifts, including the courage to live past our fears and a reason for living, a vocation of pointing others to Christ, serving them in Jesus’ Name and inviting others to follow Christ, a vocation that lasts our whole lives.